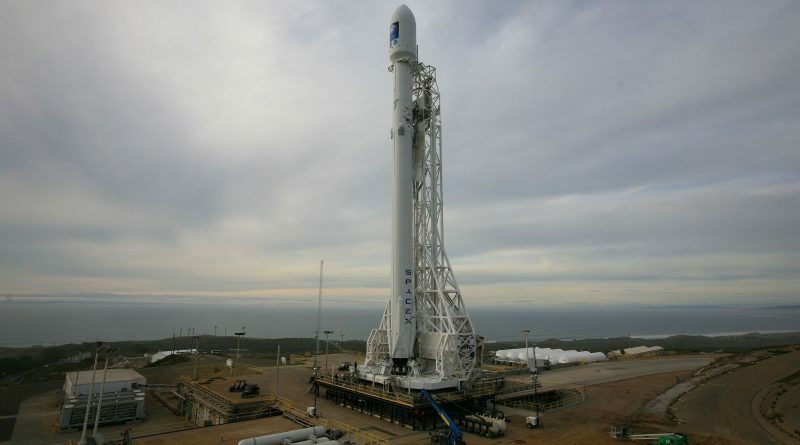 Delays to the maiden flight of SpaceX’s Falcon Heavy rocket, exacerbated by the prolonged stand-down of the company’s Falcon 9 after a testing accident, prompted satellite operator Inmarsat to move one of its payloads from a planned launch on Falcon Heavy to the European Ariane 5 rocket to ensure a mid-2017 liftoff. SpaceX is facing an increasingly backed up launch manifest for its Falcon 9 and Falcon Heavy rockets due to a pair of launch and testing failures involving the Falcon 9 and numerous delays to the Falcon Heavy debut which currently stands at a mid-year 2017 target. The first launch of Falcon 9 since its Sept. 1 explosion on a Florida launch pad had been planned for as early as December 16 carrying the first batch of satellites into orbit for Iridium’s next generation voice and data network. However, it was announced this week that the mission had to be deferred to early January because of open work left in the investigation into the on-pad explosion. SpaceX is under contract for seven Falcon 9 missions, each carrying ten Iridium-NEXT satellites into a 625-Kilometer orbit. 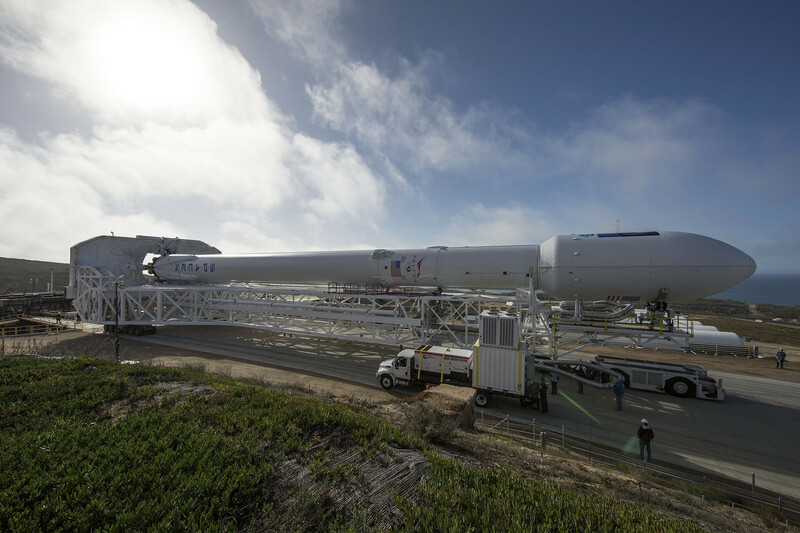 Both stages of the Falcon 9 FT launch vehicle and the first ten Iridium-NEXT satellites are at Vandenberg Air Force Base, ready to undergo final processing after the launch campaign had to be halted after the testing mishap in early September. 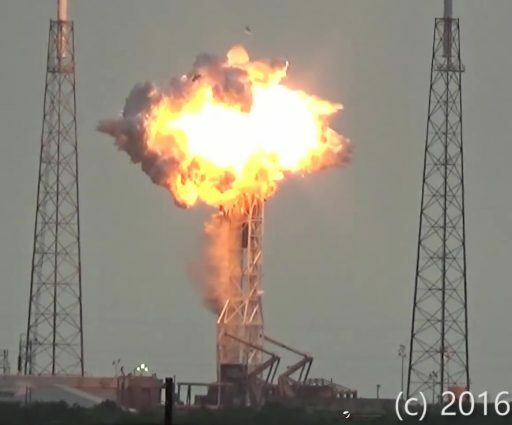 SpaceX found the cause of the on-pad explosion was a condition arising from the rapid sequence of filling the rocket’s second stage with sub-cooled Liquid Oxygen and Helium tank pressurization gas which caused solid Oxygen to build up between the carbon fibers of the high-pressure Helium tanks. If put under pressure by a contracting tank structure, the solid oxygen could not escape, causing an explosion in which the tank material itself acted as fuel. SpaceX arrived at this conclusion after reviewing data from the mishap and studying debris while also replicating the conditions in highly instrumented tanks at the company’s test range in Texas. Observers have been reporting regular explosions from the McGregor site up until this week as SpaceX went through a number of testing scenarios to work out which precise conditions lead to the formation of the dangerous solid oxygen. According to the company, future explosions can be avoided by changing the sequence of filling the second stage with propellants and pressurant – avoiding an even longer gap in launches if a hardware re-design had been necessary. To proceed with caution and fully close out the investigation and associated agency reviews, SpaceX decided to punt the Iridium-NEXT mission to a 2017 launch date. At present, it is unclear which mission will go first in 2017 – Iridium-NEXT from Vandenberg or EchoStar 23 which will become SpaceX’s first launch from Launch Complex 39A at the Kennedy Space Center as the SLC-40 pad remains out of commission due to damage received in the Falcon 9 explosion. 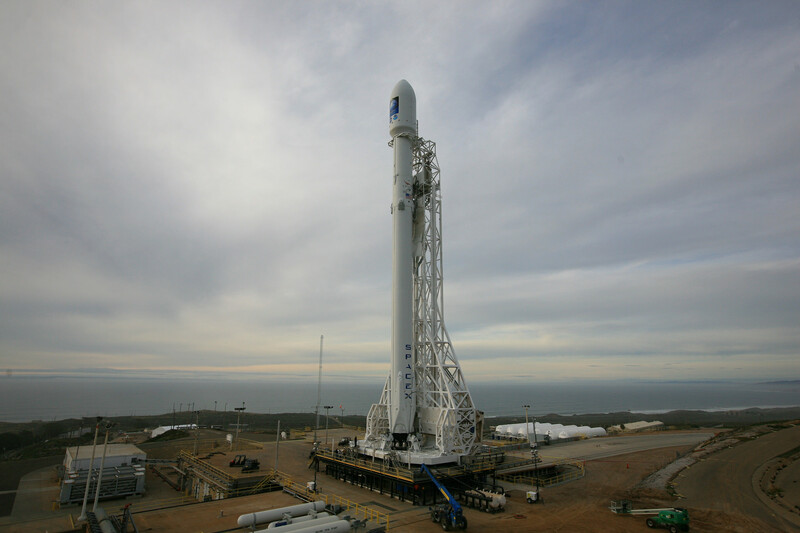 Iridium backed SpaceX up in their decision to delay the launch in order to help ensure a maximum chance of mission success. “We remain as confident as ever in their ability to safely deliver our satellites into low Earth orbit,” Iridium said. With the lengthy Falcon 9 stand-down, SpaceX will not be able to finish the deployment of the 70-satellite constellation by the end of 2017 as had been the original plan and Iridium is now looking at early 2018 for reaching the full strength of the system. While Falcon 9 gets back into a launch posture, Falcon Heavy’s debut is still around half a year away following repeated delays which have now forced London-based satellite operator Inmarsat to shift their EuropaSat/HellasSat 3 spacecraft to Europe’s Ariane 5 rocket that offers a higher schedule certainty for a liftoff by mid-2017. Inmarsat secured one firm launch contract on Falcon Heavy plus two options in mid 2014 with a first liftoff expected by the end of 2016 – a deadline imposed on EuropaSat by the European Aviation Network (EAN) S-Band payload hosted on the satellite to deliver high-quality broadband to aviation customers when flying over all 28 European Union States. With Falcon Heavy’s first flight slipping well into 2017, the Inmarsat launch could not reasonably be expected prior to mid-year even if there were no more delays. This prompted the company to begin searching for other launch opportunities, looking at the Russian Proton and Europe’s Ariane 5 as options. Arianespace managed to find a space for Inmarsat by mid-2017 and both companies announced the agreement earlier this week. With a launch mass of around six metric tons, EuropaSat will take the upper slot on the Ariane 5 rocket with a lighter payload riding underneath to share the cost of the launcher which comes at a higher price tag than SpaceX’s Falcon Heavy. Inmarsat did not explicitly state whether the Falcon Heavy contract was canceled or if the company was reserving it for a future mission. 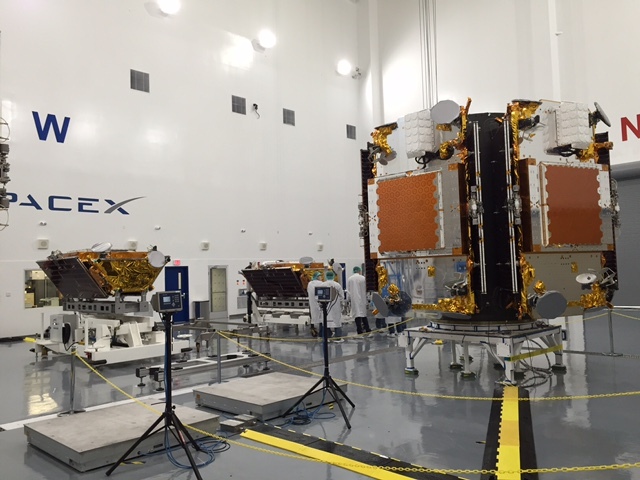 At present, Inmarsat has two more contracts with SpaceX for the launch of Inmarsat 5-F4 on Falcon 9 in 2017 (switched from Proton) and Inmarsat 6-F1 on Falcon Heavy in the 2020 time frame. 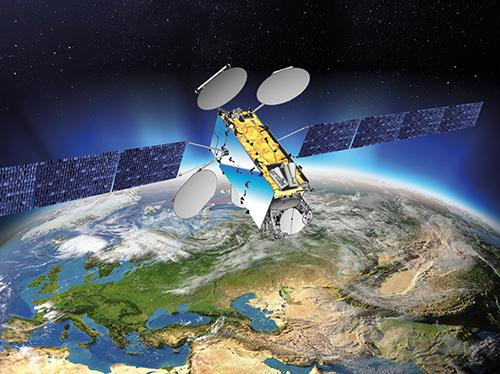 EuropaSat / HellasSat 3 represents a condo-sat operated by Inmarsat and Hellas Sat (a division of ArabSat), combining a Mobile and Fixed Satellite Services payload. The satellite is built by Thales Alenia Space based on the powerful SpaceBus-4000 C4 platform and outfitted with an S-Band payload for EAN and 44 Ku- + 1 Ka-Band transponders to deliver Direct-to-Home Television and telecommunication services in Europe, the Middle East and Africa. SpaceX is facing a very busy manifest in 2017 which will require a failure-free year and a steady launch pace from both coasts of the United States. 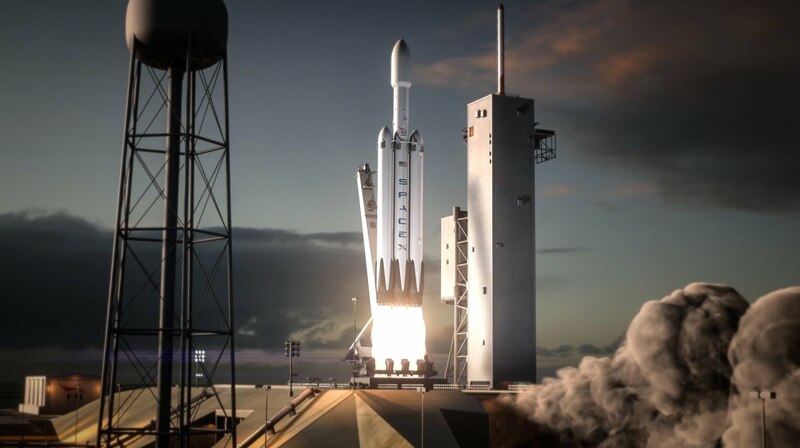 Falcon 9 will be the main player with Falcon Heavy hopefully joining by mid-year to fly an initial shakedown mission followed by the STP-02 mission of the United States Air Force followed by the first Red Dragon Mars mission in April/May 2018. Also planned for 2017 is SpaceX’s launch abort test for the crewed Dragon 2 vehicle followed by the first orbital test flight of the spacecraft in August and the first crewed mission to the Space Station in November if the current schedule can be held.